Hort Elementary School students create “Get Well Cards” as part of their annual Great Kindness Challenge. 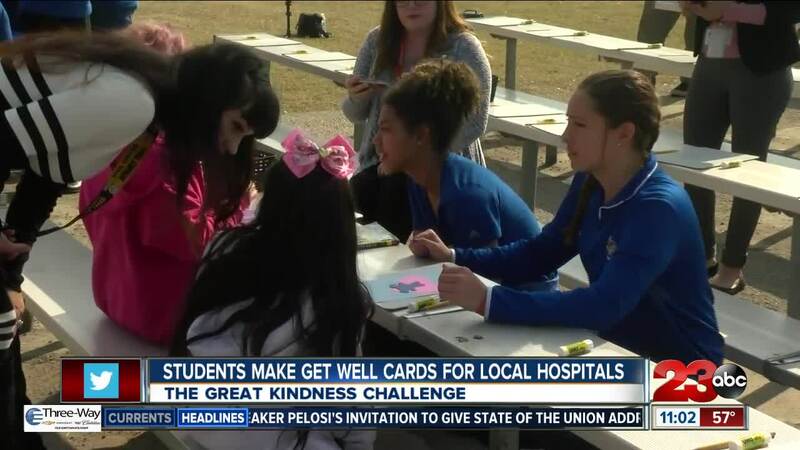 BAKERSFIELD, Calif. — Hort Elementary School is having its annual Week of Kindness Challenge this year and today students wrote “Get Well” cards that will be passed out to patients in hospitals. The organizer, Delia Barron, says this is an event that helps remind kids that being kind to others and spreading love is important, especially as they grow older. CSUB athletes were also volunteering their time to help children create their cards. The cards will be handed out to patients within the next week and are a way to boost their energy and give them hope.